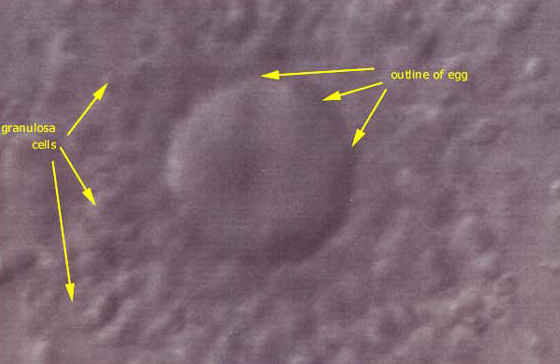 Photomicrograph (microscopic view) of a higher (microscopic) power view of a human oocyte (egg) that is surrounded by a mass of (granulosa) cells, seen following egg retrieval for In Vitro Fertilization (IVF). This cumulus is seen to be expanded into a starburst like pattern, usually signifying a mature egg. An immature egg often possesses an irregular shape, dark ooplasm (protoplasmic portion of the egg, inside the “shell”), and a compact multilayer corona that does not radiate outward.